Here’s an easy way to reduce the risk of death from heart attack – by 50%. Just drink less of this popular refreshment (and most people think this drink is healthy!) 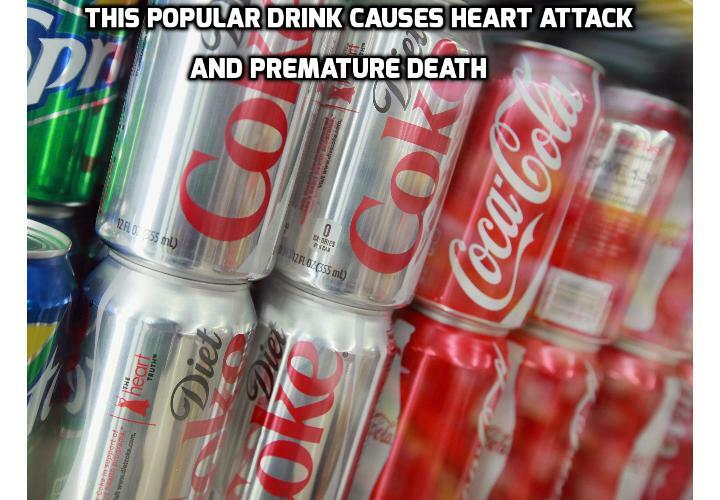 to avoid heart attack and premature death. Really. That’s all you have to do. How neat is that? A research group from Iowa University observed the consumption of diet drinks of 59,614 participants in the Women’s Health Initiative Observational Study. Participant’s average age was 62.8 and none had a prior history of cardiovascular disease at the beginning of the study. Researchers divided them into five groups depending on how many diet drinks they consumed per week. 8.5% of those who drank 14 or more diet drinks per week had experienced a primary cardiovascular event. Compare that to 6.9% in those who drank 5 to 7 drinks per week, 6.7% in the 1 to 4 drinks per week group and 7.2% in those who drank less than one per week. Those who consumed more than two diet beverages per day were 30% more likely to suffer from heart disease and 50% more likely to die from heart attack than those who never consume diet drinks. The cause is the dangerous aspartame sweetener in diet sodas. Aspartame breaks down into dangerous chemicals including methanol, formaldehyde and formic acid. Even regular soda drinks are healthier than diet ones, of course only when consumed in moderation. Water is, however, best – so leave the rest to avoid heart attack.